This Tron-inspired hotel room is already perfect. You can tell that by just looking at it. But the fact that it's built inside the Ice Hotel in Sweden makes it even more jaw-droppingly incredible. Now I have to stay there. The designers, Ben Rousseau and Ian Douglas–Jones of Extreme Design, are "massive fans" of Tron and decided that since the movie was coming out this month, that they would design an "art suite" after the Tron style. The room is called the "legacy of the river" and most of its inspiration is from a nightclub scene in the movie. 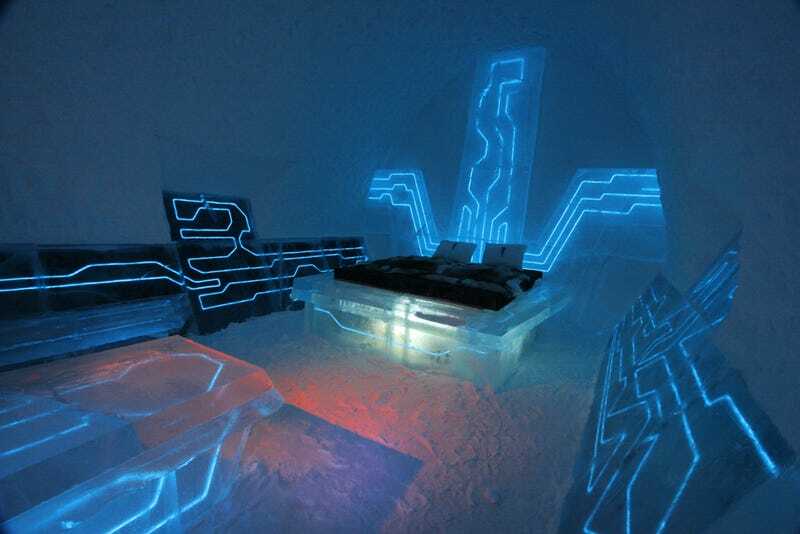 It's one of 19 unique rooms at the Ice Hotel in Jukkasjärvi, Sweden (who is celebrating their 20th anniversary).